1. Make your own cake. Buying a birthday cake from a bakery can be a costly proposition. Instead, get a couple boxes of cake mix and frosting to make your own. Cupcakes are even better! Get a fancy star tip and decorating bag to put a neat swirl on top. 2. Use solid color party-ware. Your child’s party can still be themed with their favorite character or activity, but instead of having all matching cups, plates, napkins, and more, pick up some solid color items to match. They are less expensive and are easy to match the themed items. You will save money by just getting the themed invitations, a centerpiece, and a mylar balloon. 3. Just serve cake and ice cream. Much of the cost for a birthday party is in the food. Invite your guests over in between lunch and dinner. That way the only items on your menu can be cake and ice cream. 4. Go back to the basics for party games. It is easy to host some party games with items found around your home — think three-legged races which only require something to tie ankles together, a spoon and egg race, musical chairs, and freeze tag. Serve cake and ice cream before the games so that the kids can burn off all the extra energy! 5. Cut back on party favors. It can be so tempting to go overboard on party favors to send home with your guests. Instead bake some cookies, place them in a cellophane or sandwich bag, tie with some ribbon to match your party theme, and place them in a basket by the door to hand out as people are leaving. This a great activity for your child to participate in if they love to bake. Your child can still have a great birthday party even without spending a bunch of money. Follow one or all of these tips to help celebrate their special day and stay on budget. We save on birthday parties by only letting the kids have a blow-out bash party every other year. The year in between we let them invite one or two friends over for a family mini-party at home. Saving on the costs of renting or paying per kids at amusement places…. We alternate this with buying new Halloween costumes on the year they do not have the full out parties.. giving them something to look forward to. Then they re-use costumes the year we have big bday’s. We save on the cost by making the meal ourselves. We ask what the kids want to eat for their birthday meal and make it. My kids pretty much wanted the same meal each year. We also made the cake. When my son was six years old, we made treats for the birds as three of our activities, decorated the paper bag used to bring home the bird treats, and put the bird treats inside and that was their party favor. Very inexpensive and the kids enjoyed it and the kids could feed the birds when they got home. We all had fun. We’ve done other things for birthday parties that is unique. When the kids were very small, we had just grandparents, and then some of the cousins. When the kids were older, then the parties got some bigger, but not huge. My daughter and her friends don’t do goodie bags at all. Totally not necessary. I have little ones, so I haven’t had much experience. I’m looking forward to reading everyone’s ideas. For my little girl’s 3rd party, I got her favors from the Target One Spot when everything was 70% off. This was great as they were summer toys and she has an early October birthday. Our kids don’t really like parties. They might ask for their grandparents to come over or for one friend to come, but it’s always a small gathering. There are plenty of ways to make a child feel special on their birthday without a party. People often forget that, at the end of the day, people won’t remember your fancy party favors or gourmet fruit platter. They’ll just remember the fun atmosphere and the birthday festivities – all the costly stuff really is trivial. It’s best to go for the basics and focus on having a good time. Or make a cake from scratch – it’s really not too hard, and so much tastier than the box mix kind! I took a basic cake decorating class at a craft store years ago. I am not very good at all, but my kids LOVE that I make their cake. The first one I did was a basic Elmo for my 2 year old. Then, I did Hello Kitty for my 5 year old. This year, my 6 year old wanted Sofia the first. I bought the little cake kit from the Walmart bakery and made the cake myself. It turned out great. One tip I learned that has made a huge difference for me…If you want to do a character cake, print an image of the character off the internet (the more basic the better and print it in mirror image) Then, trace it in frosting. Turn the image over onto your cake, and it will leave an outline for you to fill in. SUPER EASY!!!! When our kids (we have 4) were very young, I laid down the law on birthday parties, and I am SO GLAD I did! They each got/get a party when they are 5, a sleepover at age 10, a sweet 16 party, and a high school graduation party. That’s it. Everyone gets the same consideration and no one feels left out. Plus mom doesn’t lose her mind!! It has worked great for us. And, now that my kids are 21, 18, 16, and 14, it seems they’ve all survived just fine without sweeping gala events every year! Also, can I say that as the mom of kids who get invited to ridiculously extravagant parties every year, I HATE having to buy all the gifts, rearrange our schedule, etc so that their children can have gala events event every single year. It’s just ridiculous! Ok, off my soapbox now! We have 4 children and only do parties every other year (starting at school age, last party at 12). The other years they invite a friend over for dinner and go to a movie. For us, it wasn’t just the cost of all the parties (although that was a big factor!) it was also the “stuff”! 4 children, 10 guests, that’s 40 new “toys” or things coming into the house every year! Just too much!! That was a big reason for us not to do birthday parties! We simply didn’t want all the gifts. We have had other parties at our house that aren’t birthday parties. The children still get to have friends over, but the whole thing is much simpler. My oldest and her friends started having country themed parties. They serve food from that country, dress up (we did hosted an Ancient Greece party), and play ideas revolve around that. My middle daughter has used her birthday parties to collect items for missionaries she knows. I’ve known other kids to say “no gifts” or collect for an animal shelter. She still gets to have fun with her friends, and feels good about providing something to a mission she believes in. We did “big” parties every year at home until they turn 10, then went to smaller parties…which have actually been more expensive since the activities were more expensive! My other suggestion is share parties! The same daughter had a best friend with the exact same birthday. She shared parties with her for four years. We build things, sew things, bake things, find costumes for everyone. Whew! It is the ONLY extravagant thing our family really does. But, we have to stick to a small budget, even so. 3) use Pinterest for homemade decor and game ideas, scavenger hunts and obstacle courses are always a big hit. 4) borrow everything you can, don’t rent! We have different friends with tents, tables, horses and other animals, helium tanks, serving dishes, refrigerator boxes, swimming pool, you name it. 5) mention in your invites that it is a “drop-off party ” if the kids are old enough, otherwise your are trying to accommodate parents as well as kids. 6) only have a few guests, I tend to like six children, plus my three, and a few relatives. 8) skip the balloons, they can get expensive pretty fast, if you don’t have a helium tank. Crepe paper all done up on the ceiling is only a couple of dollars. 9) use twin flat sheets for table cloths, Walmart has them for $3 each. Now I have a stash of them and have used them for the last ten years. 11) no birthday gift from mom or dad, the party is their gift. It amazes me that parents think their children need a big birthday party every year. A family celebration and doing something fun is more than enough. I think this is a great idea. I have to say, skip the Dollar Tree balloons if you have a helium tank at home. Those balloons don’t hold the helium even worth the $1 you paid for the pack of them. Target has inexpensive (I think $1.24/pack) balloons that were far superior. I am having my daughter’s 7th birthday party Saturday at our house. The theme is snow. We are playing pin the nose on the snowman, guess how many candies are in the mitten, and decorating our own goodie bags (brown lunch sacks) with stickers and stamps. I hired a high schooler to make balloon animals for everyone for $20. And we invited 7 kids, that’s it. There’s snow in the forecast, too, so we might simply eat cake, play some games, and build a birthday snowman! I inadvertently spent a fortune (at least to me) on my child’s birthday party at a fun center last month. He really wanted a party, our house was under repair, and we don’t have many other options in our area. I think we would have had a better party at home, and I enjoy the planning them. Either way, it’s only a few years that you have the chance to do these special birthday parties. I am putting the kabosh on birthday parties also, and my oldest kid (the only one who really cares at this point) is all for it. This year, she had a friend sleepover on the weekend after her birthday. Her birthday is on Halloween, and trick or treating was over the weekend, so that was a natural activity for them. My oldest is 7, and I have a 3yo son and my baby turns 1 on Christmas Eve. We’re having family over the weekend after Christmas for the baby’s birthday, and then no parties till my son turns 5. We’ll be doing parties at ages 5, 10, 16, and high school graduation. And that’s that. The birthday kid will still get to choose their birthday day foods, have a cake made by me (I have made some FANCY cakes! When my oldest turned 5, I made her a fantastic Candyland-themed cake), and have a friend sleepover if they want during the years there is no party. The money I save on not having a party goes into the child’s savings account. When my oldest turned 1, I’d just gotten over viral gastroenteritis and I had 50 people coming to my house for her birthday. It was awful. When she turned 2, 30 people were supposed to come and 10 didn’t show up, so I had this pile of extra food (wasted time, energy, and money). I got tired of that. Too stressful and expensive. We have a small neighborhood with TONS of kids. We stopped doing parties years ago. We have our family party, and then afterward invite all the neighborhood kids for cake. The kids all have a ball, they feel like they had a party, and we do NO GIFTS! It is easier and more fun, and I get to put all my effort into the most fun part for me, which is making the cake. I have never understood spending hundreds of dollars on a party that must be done every year. We have always done cake and ice cream at home with grandparents, aunts, uncles, and cousins. Occasionally we’ll get a couple of $5 pizzas from Little Caesars. Dollar Tree or Wal-Mart (sometimes they are cheaper) for plates, napkins, etc. A bought cake if I don’t have time to get one put together myself, usually only $15-20, Sam’s Club has great cakes, but I usually make one since my son began requesting homemade cakes when he was four. 🙂 Things like these that are done in excess make no sense, especially when children tend to expect the excess the older they get if they get it every year. My mom hosted birthday parties for us when we were little and I treasure those memories. As a parent I appreciate her more each day as I put forth the effort for my own children. I am actually hosting a birthday party today for my eight year old son. He is having a hunting themed party and just like someone else posted Dollar Tree is a great source for party favors. I was able to buy a play set for $1 that includes a small set of binoculars, a play compass, a play watch, plastic knife, a map and glasses that they are going to find on a scavenger hunt and be able to take home with them. Oriental trading is another great spot to look for party favors. Last month my daughter had a puppy themed party and were able to order her adorable puppies to send home with her friends that were only a $1. We made collars for the dogs with almost all of the supplies from around the house. I did pick up one more bag of beads for $1. If you plan ahead they usually do free shipping quite often. I also made my own invitations for my son’s party and I found free ones online to print for my daughter’s. I also make my own cakes and while my skills are not amazing my kids think they are! I have started hosting birthday parties with friends when they are 6 and every other year after that. Some years they have chosen something simple like bowling with 3 friends and other times they want a party at home with more friends. 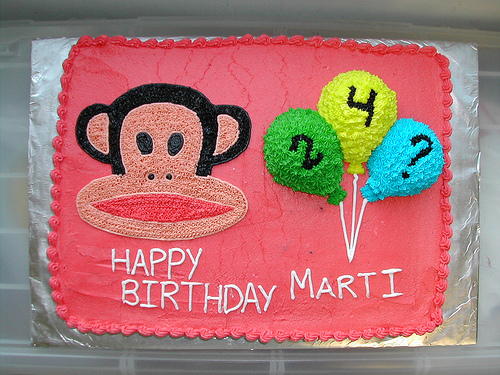 Growing up, I resented that my friends always had bakery cakes with decorations and fancy writing. Now that I’m grown, though, I know that my mom’s homemade birthday cakes were not only baked with love, but they also tasted so much better than the store-bought kind. As a mom, I love the opportunity every year to make a cake or cupcakes to celebrate my children’s special days. Three of my kids birthdays are withing 4 days of one another, so we have the option of doing a combined party but even then it gets expensive. So, this year we had a PJ & Movie Night for their parties and it was SUCH a big hit. The girls had a night where they invited a handful of girls and my boy did the same. The parents dropped off their kids in their pj’s after dinner (we did 7-9 p.m.), we popped popcorn, had cupcakes and enjoyed a Veggie Tales movie together (my kids are 6,4,3,&newborn). The kids and parents loved it. It was something special to my kids, yet very inexpensive. The boys didn’t last the entire movie so we just cut it off and played until parents came. I actually think we’ll keep this up in the future as a birthday tradition. Growing up as a girl, my mom used to make a cake-mix cake in an 11-inch pan, and had the guests and myself decorate it together with tons of frosting, sprinkles, etc. It was loads of fun, and I never realized as a kid it was a “cheaper” way to have a birthday cake. It was just what we did, and we had a blast. It might be fun to do this on a smaller scale with “decorate your own cupcakes” instead. That way, the birthday cake doubles as an activity. I bought a set of 10 plastic party (multi-colored) plates from Ikea for I think, $2. I bought 2 sets. They are very sturdy and I know a lot of people like paper plates because of the no-mess factor, but from a cost and environmental factor, it’s a better option for me to never have to buy birthday plates again. I also use them for cook-outs too. Although I am one of the parents who go all out for my child’s birthday, I have my own personal reasons for doing so. I do stick to a budget & try to shop clearance/sales for items I may need. This year, I used Etsy for several party related items that were inexpensive & hand-made. I thank our Heavenly Father daily for our one & only child. Each birthday is a joyous occasion to celebrate our miracle baby. I tried for many years/saw multiple doctors just trying to have a baby. I do think the author has wonderful ideas & I am simply mentioning another situation so others may understand why “that family always goes over-board on one day out of the entire year for their only-child. I do not consider my child spoiled. I am so grateful to God that he gave me the greatest blessing to finally become a Momma. If I had multiple children (w/o infertility struggles) I would perhaps rethink the over-board parties, but for now we will enjoy celebrating the birthday with family/friends with an all out bash. My oldest son just turned seven and had his first “friends” birthday party. (We usually just celebrate with grandparents and his two cousins.) I baked cupcakes ahead of time and put small bowls of colored frosting and assorted containers of sprinkles (left over from past holidays) on the table and let the kids decorate their own cupcake. I bought a number 7 candle for my son to make his cupcake extra special and so he had a candle to blow out after we sang. The kids loved it, I didn’t have to decorate a cake, and it was both activity and birthday treat in one. I spend about 50 for party….my mom always makes the cake….which is a lot cheaper for me because our cakes have to be gluten free. Also you can always have snack food if you want to still feed you guest a little. Along the “Bake your own cake” line, one year I baked cupcakes inside ice cream cones and our activity was decorating your own cupcake-cone. I bought the plain white vanilla icing and we mixed little bowls for each child to have custom color, there were sprinkles, and everyone got a candle in their cupcake. It was a real hit because EVERY kid wants to blow out the candles.